We´ve seen an explosion of chatbots and the use, and abuse, of Artificial Intelligence used in internet marketing and sales. Yet, as allways introduction lags in Latam. We want to build a damn stupid chatbot that does one good thing first: qualify for sales. With artificial intelligence on the rise we asked ourselves on why not deliver a solution that can help harness each customer´s needs in the sales process, and the answer is simple and its because it´s not scalable. Not for us, not for our clients. Instead we want to take an easier approach that adds more value. In digital marketing a customer journey can vary from years to days to minutes (as I´ve seen firsthand selling MBAs, Cars or cleaning products) , but there´s always a critical part that determines sales and it´s engagement. Now we´ve move from lead capture to chatbots but still the story is how to correctly qualify someone´s capacity and intent in order to allocate your salespeople. We believe that a simple, 4-10 iteration conversational bot can solve this for most companies. And that´s scalable. 2.- Why for Latam companies? Latinos are a special bunch. More open to people, less open to risk. 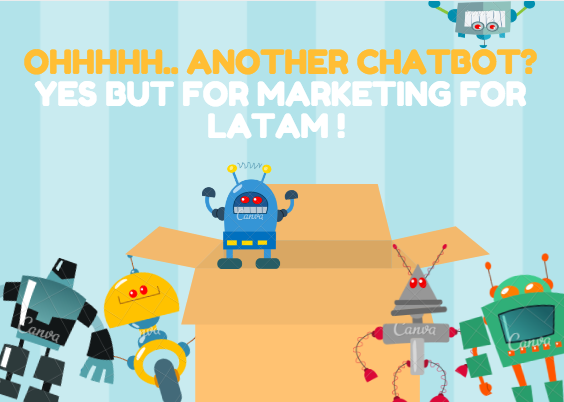 Our experience as pioneering partners working B2B for the top rated Marketing automation platform as well as a leading artificial intelligence for sales assistant has put us in front of a lot of execs and managers in the biggest companies in Latam, heck at least 3000 of them as per my CRM and 100 of them as per my digital marketing agency´s clients list (now we only do Strategic advising on digital transformation, and recommend people and software for tactical). Now we think it’s time to go for it. With internet marketing ad spend between 10 to 30% of total ad budget and growing knowledge of the importance of digital transformation in marketing and sales, and the rise of the promise in Artificial Intelligence bots, now is the time to create a simple one that adds value and evolves as it scales. And the most value added today is to qualify to route to a salesperson and boost sales.